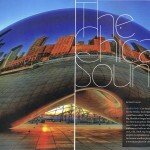 This article by Robert Loerzel originally appeared in Listen magazine’s September-October 2009 issue. When poet Carl Sandburg called Chicago “Hog Butcher for the World, Tool Maker, Stacker of Wheat,” he easily could have added “Music Maker” to that list. The City of the Big Shoulders forged so many of the sounds that became popular American genres. This urban melting pot was one of the places where blues, jazz, gospel and even country music began to take shape. Today, its nightclubs and concert halls are alive with all those sounds — plus rock, folk, R&B, hip-hop, electronic and ethnic music. 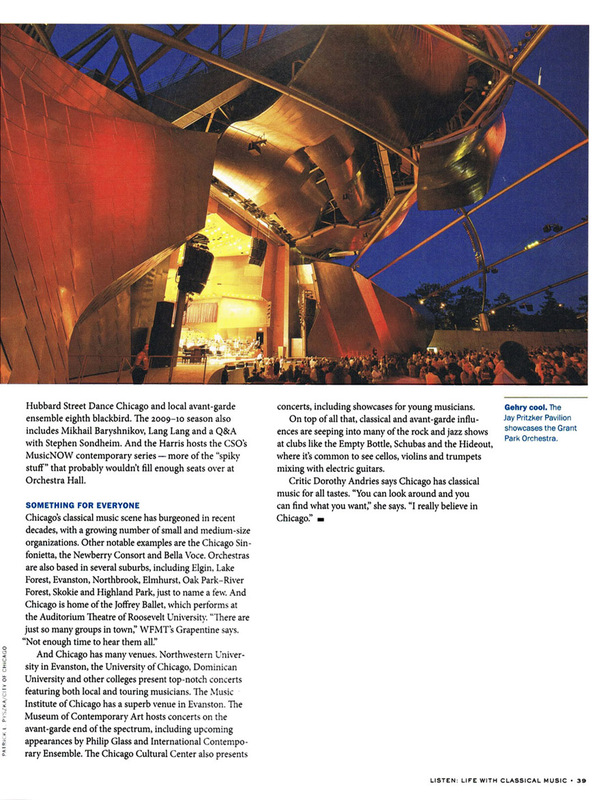 And despite its reputation as a “stormy, husky, brawling” town (to borrow another phrase from Sandburg), Chicago is also a sort of a paradise for classical-music aficionados. The earliest evidence of music being performed in Chicago comes from the 1830s, when the place was just a frontier outpost. The owner of the Sauganash Hotel, Mark Beaubien, played a fiddle to entertain his guests. “He played it in such a way as to set every heel and toe in the room in active motion,” an early settler recalled. “He would lift the sluggard from his seat and set him whirling over the floor like mad!” Beaubien himself joked that his musicianship was not exactly divine. “I plays de fiddle like de debble, and I keeps hotel like hell,” the Frenchman reportedly remarked. Chicagoans got a taste of more highbrow music in 1850, with the formation of the city’s first classical group, the Chicago Philharmonic Society, and the first local performance of an opera. 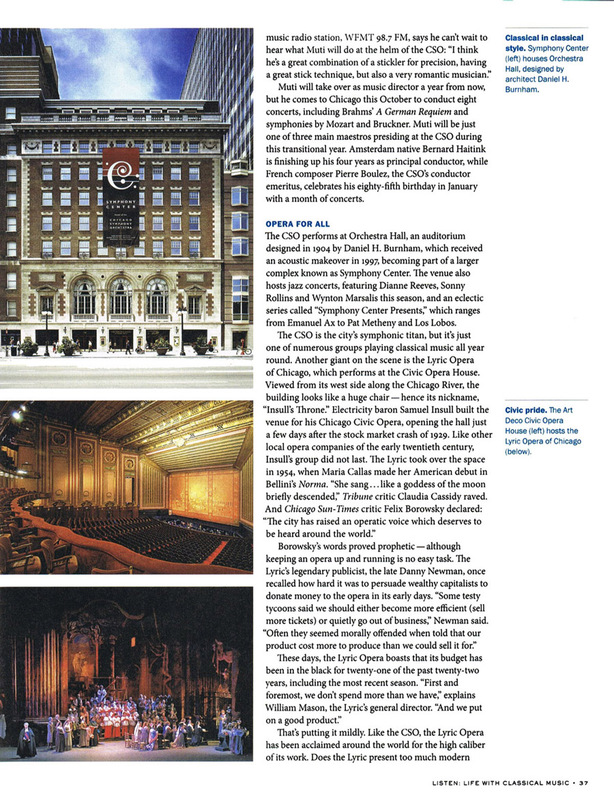 Opera did not get off to a promising start in Chicago, however — the theater burned down in the middle of the second performance. Thomas insisted that his new orchestra should play only what he considered the best symphonic music, even if it was music that few people understood. “Mr. Thomas is here to establish a great art work,” explained his wife, Rose Fay Thomas, “and to make Chicago one of the musical centers of the world — not to provide a series of cheap musical entertainments for the riff-raff of the public.” The “riff-raff” may not have appreciated everything that the CSO played, but the orchestra persisted, and by the middle of the twentieth century, it had earned a reputation as one of the world’s best. After a four-year search for a replacement, the Chicago Symphony Orchestra made a stunning announcement in 2008: Acclaimed Italian conductor Riccardo Muti would be taking over as the CSO’s music director in 2010. 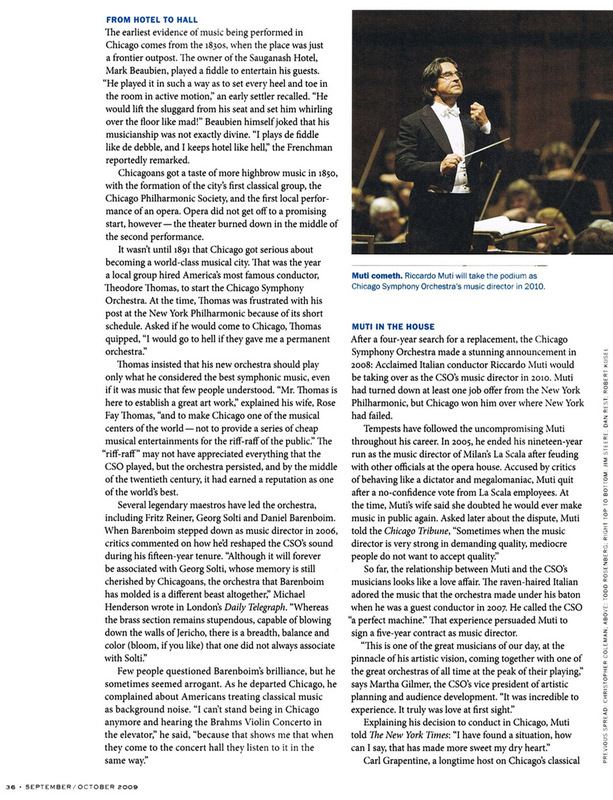 Muti had turned down at least one job offer from the New York Philharmonic, but Chicago won him over where New York had failed. So far, the relationship between Muti and the CSO’s musicians looks like a love affair. The raven-haired Italian adored the music that the orchestra made under his baton when he was a guest conductor in 2007. He called the CSO “a perfect machine.” That experience that persuaded Muti to sign a five-year contract as music director. Muti will take over as music director a year from now, but he comes to Chicago this October to conduct eight concerts, including Brahms’ A German Requiem and symphonies by Mozart and Bruckner. 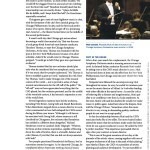 Muti will be just one of three main maestros presiding at the CSO during this transitional year. Amsterdam native Bernard Haitink is finishing up his four years as principal conductor, while French composer Pierre Boulez, the CSO’s conductor emeritus, celebrates his eighty-fifth birthday in January with a month of concerts. The CSO performs at Orchestra Hall, an auditorium designed in 1904 by Daniel H. Burnham, which received an acoustic makeover in 1997, becoming part of a larger complex known as Symphony Center. The venue also hosts jazz concerts, including Dianne Reeves, Sonny Rollins and Wynton Marsalis this season, and an eclectic series called “Symphony Center Presents,” which ranges from Emanuel Ax to Pat Metheny and Los Lobos. Another landmark of the Chicago classical world is the Ravinia Festival, in north suburban Highland Park, the summer home for the Chicago Symphony Orchestra since 1936. With James Conlon serving as music director and frequently conducting the CSO, Ravinia also features touring classical acts such as the Kronos Quartet and a long roster of jazz, dance, world-music and mainstream pop musicians, ranging from Tony Bennett to Elvis Costello. 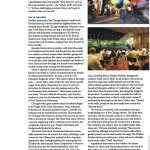 Ravinia’s focal point is a pavilion with three thousand two hundred reserved seats, and the grounds also include two smaller, enclosed venues where chamber groups and cabaret singers perform. But many concertgoers prefer to sit on the lawn with blankets, picnic baskets and bottles of wines. They can’t see the stage, but they do hear symphonic sounds or pop tunes coming over the speakers. When it opened as an amusement park in 1904, Ravinia was billed as “a place of entertainment for people of culture and refinement.” In 1929, a critic for The Chicagoan magazine wrote: “The casual visitor at the huge park … cannot fail to come under the sway of the specific magic of the place. When there is a moon it seems to do its best for Ravinia. Even the passing trains of the Northwestern hoot pianissimo.” Those same words are true today. “It’s just a little bit of heaven,” says Dorothy Andries, a critic for suburban Pioneer Press (and sister of Sun-Times critic Delacoma). Chicago’s other great outdoor musical tradition began at the height of the Great Depression, when American Federation of Musicians president James C. Petrillo was seeking work for unemployed musicians. 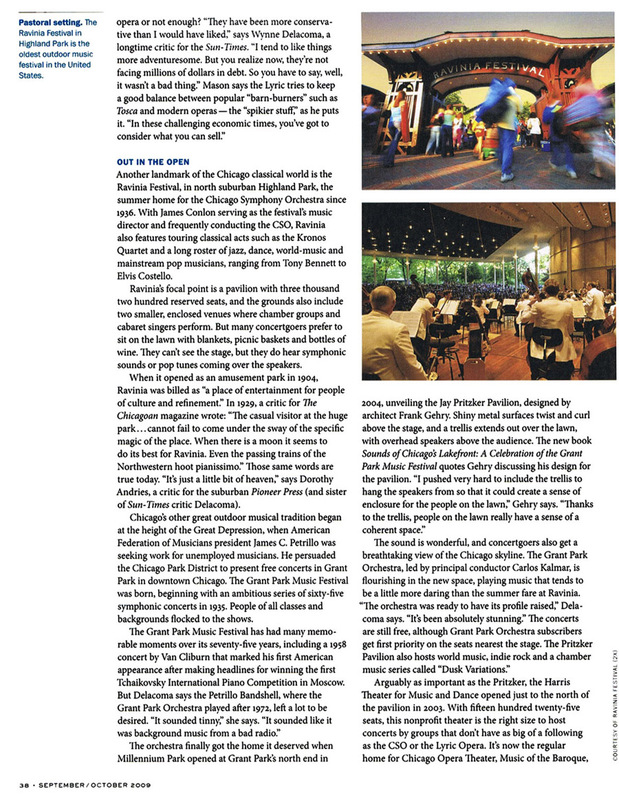 He persuaded the Chicago Park District to present free concerts in Grant Park in downtown Chicago. The Grant Park Music Festival was born, beginning with an ambitious series of sixty-five symphonic concerts in 1935. People of all classes and backgrounds flocked to the shows. Arguably as important as the Pritzker, another venue opened just to the north in 2003 — the Harris Theater for Music and Dance. With fifteen hundred twenty-five seats, this nonprofit theater is the right size to host concerts by groups that don’t have as big of a following as the CSO or the Lyric Opera. It’s now the regular home for Chicago Opera Theater, Music of the Baroque, Hubbard Street Dance Chicago and local avant-garde ensemble eighth blackbird. 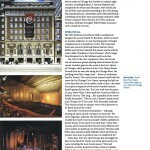 The 2009-10 season also includes Mikhail Baryshnikov, Lang Lang and a Q&A with Stephen Sondheim. And the Harris hosts the CSO’s MusicNOW contemporary series — more of that “spiky stuff” that probably wouldn’t fill enough seats over at Orchestra Hall. 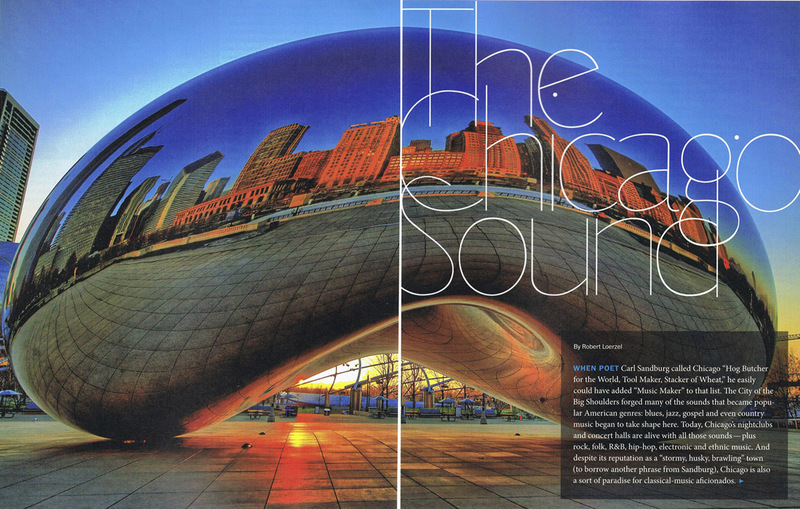 And Chicago has many venues. Northwestern University in Evanston, the University of Chicago, Dominican University and other colleges present top-notch concerts featuring both local and touring musicians. 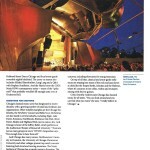 The Music Institute of Chicago has a superb venue in Evanston. The Museum of Contemporary Art hosts concerts on the avant-garde end of the spectrum, including upcoming appearances by Philip Glass and International Contemporary Ensemble. The Chicago Cultural Center also presents concerts, including showcases for young musicians. On top of all that, classical and avant-garde influences are seeping into many of the rock and jazz shows at clubs like the Empty Bottle, Schubas and the Hideout, where it’s common to see cellos, violins and trumpets mixing with electric guitars.